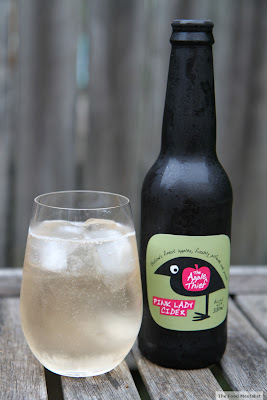 This week I'm very happy to introduce you all to my favourite Australian Cider - The Apple Thief - Pink Lady Cider from the Southern Highlands of New South Wales. 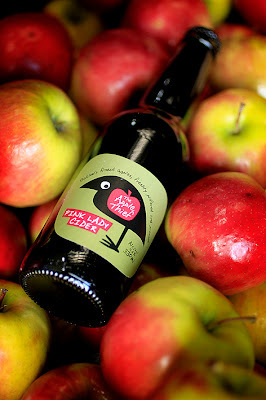 I first discovered this Cider last October (2011) when Pete and I travelled down to Bowral in the Southern Highlands to celebrate our first wedding anniversary. The bar at the hotel we were staying at had a funky little promotional 'table talker' where we were seated. I was instantly drawn to the quirky logo and the fact that it was local to the area we were staying. We were waiting for our taxi to Biota Dining which arrived a little early, hence preventing us from trying the cider at the bar. Persistent, we decided to stop in at the Dan Murphy's at Mittagong on the way back home to Sydney assuming that they would stock this particular local cider. Unfortunately, they didn't and so our introduction to The Apple Thief didn't eventuate. Fast forward to February this year when we ventured back to Bowral to spend the weekend. We stopped in at Josh's Cafe at Berrima and noticed the cider on the menu.A couple at the table a few across from us were enjoying two bottles - I was intrigued by it's pink colour. Having already ordered wine to go with our lunch we didn't get to try it there either. Determined, we decided to stop in at the bottle shop at the Bowral Hotel and try our luck again. We managed to snare the very last 4-pack. Super excited, we tried it that night and were both very impressed. This is a true boutique cider produced by duo David Purcell and Charlie Ostaszewski. David has over 20 years experience working in the apple industry and personally selects only the best pink lady apples to ensure the perfect flavour. The cider is made using Batlow apples from the Snowy Mountains. The first thing you notice about this cider apart from it's gorgeous pinkish hue is how fresh it tastes. What I really love about it is that it isn't overly yeasty like many of the mainstream ciders on the market. Produced by a winemaker at Eling Forest Winery in Sutton Forest, this cider has sophistication. Not only is this cider delicious, it is crisp and has a medium finish which is perfectly balanced with the sweetness of the apples. Characteristic of the pink lady apple variety, this cider displays a slight tartness which works really well. This cider will be sure to impress. As I have said - It's my favourite Australian cider! At 4.5% alcohol, a 330ml bottle will provide you with 1.5 standard drinks. 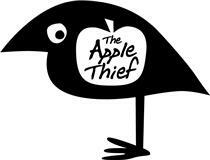 After speaking with Charlie from The Apple Thief, I can confirm that not only are they widening their distribution channels, but they are currently developing Granny Smith and Red Delicious cider varieties. 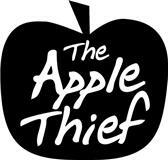 Tell me, have you tried The Apple Thief Cider? What did you think? I'm sure I've seen this one in WA. I'll try it! I hope so much that they start to sell this in the USA! Pink Ladies are my all time favorite apple. I can't get enough of them! And hard cider is my favorite adult beverage :) It's a match made in heaven! Sounds a wonderful idea to me! I love the web page and label and can't wait to try it. Is it available in London, UK ??? Thanks Jess for the tip. I am seeing this one pop up in more and more cafes and restaurants. Its a fantastic cider. Babsie, it's not available in the UK as far as I know but you could check out the website I posted they may ship internationally :) Good excuse to come to OZ? We Stock this at Strand Cellars, we have all 3 flavours come visit us at 12 The Strand Croydon 02 9747 5438. Hi. We recently had our work christmas party at a local restaurant and they were serving this on tap. 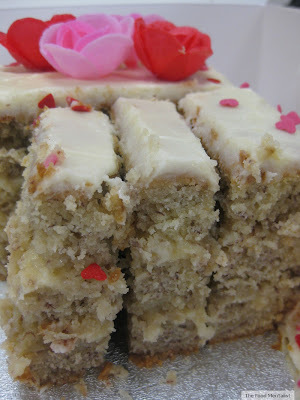 Accompanied with a few slices of apple in it, I agree it is absolutely delicious!! And Local!! I would count that as among the best gift ideas for mum. It has a zesty flavor that women will like. Very sparkling like too.